Handwriting on an Ultrabook may seem perverse to some readers, but Sony is pitching the feature as one of the big reasons to buy its new Vaio Duo 13 model. The stand out element is the ability to move between 'slate' and 'keyboard' styles, enabling users to sketch or handwrite memos on the slate with digitizer stylus that comes as an in-built feature. 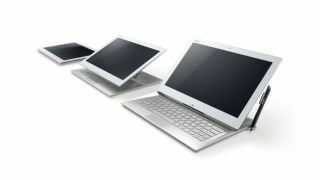 The Sony Vaio Duo 13 is aimed at the business market, with a battery life of up to 15 hours, claimed by Sony to be the longest available, and the ability to wake from sleep mode in less than a second. There's also 8GB of memory and up to 512GB SSD storage, running on Windows 8 or Windows 8 Pro and using an Intel Core i7-4500U processor. The Vaio Duo 13 comes with a stylus that, when it is unclipped from its holder, automatically launches the Note Anytime for Vaio software for memo taking, with a facial recognition feature verifying the user and saving them the trouble of a separate sign-on. The 13.3-inch screen combines full HD and X-reality technology for mobile, combined with Triluminous Display for mobile. The sound element is also being flagged up, with stereo speakers and a ClearAudio+ mode developed with Sony's digital processing technology. Sony says it's paid a lot of attention to the 'surf slider' mechanism that makes its possible to switch between slate and keyboard. The Vaio Duo 13 also has a rear-facing, 8 megapixel auto-focus camera and a built-in CamScanner application to tidy up images. Other specs include WLAN 802.11a/b/g/n, Bluetooth version 4.0 + HS, two USB 3.0 ports, HDMI out, HDMI to VGA adapter, a combined slot for a memory stick and SD card, a mobile broadband module that works with 3G or LTE, and an AC powered Ethernet to WiFi router.